Worker-farmer rally HIGHLIGHTS: The demands of the protesters are effective implementation of labour laws, minimum wage, more employment, and recognition of one crore Anganwadi and ASHA workers as a workforce. Thousands of farmers and workers started their Kisan-Mazdoor Sangharsh rally Wednesday morning from Ramlila Maidan in New Delhi. The protesters started arriving in the national capital from various states since Tuesday and were camping at Ramlila Maidan. They have reached Parliament street and will march towards Jantar Mantar as well. The demands of the protesters are effective implementation of labour laws, minimum wage, more employment, and recognition of one crore Anganwadi and ASHA workers as a workforce. 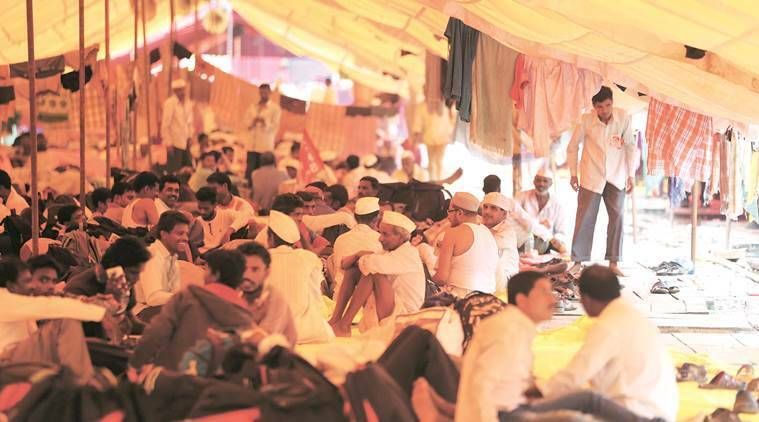 The Kisan-Mazdoor Sangharsh rally has been organised by outfits affiliated to CPI(M) — Centre of Indian Trade Unions (CITU), All India Kisan Sabha (AIKS) and All India Agriculture Workers Union (AIAWU). Also in attendance are those who participated in the Kisan March in Maharashtra in March this year to demand a loan waiver and proper minimum support price for farmers. Worker-farmer rally in Delhi today over minimum support price and minimum wage. Follow LIVE Updates here. Thousands of farmers and workers took out a protest march in the national capital Wednesday demanding remunerative prices for farm produce as per the Swaminathan Committee recommendations, loan waiver and a minimum wage of not less than Rs 18,000 a month, reports PTI. The 'Mazdoor Kishan Sangharsh Rally', which has been organised by Left-wing farmers' and workers' outfits, began from the Ramlila Maidan and culminated at the Parliament Street. This massive gathering itself reflects the failure of the Modi govt: T Narendra Rao, the general secretary of Water Transport Federation of India. Traffic is normal in the carriageway from Laxmi Nagar Towards ITO. Traffic is heavy in the carriageway from Laxmi Nagar Towards ITO. Kindly avoid the stretch. Procession reached at Sansad Marg. Workers, kisans, khetMazdoors have arrived in massive numbers for the Mazdoor-Kisan Sangharsh Rally in New Delhi on 5 September. They are determined to send a powerful message to the anti-people Modi govt. The atmosphere is festive, with songs, dances and camaraderie. ASHA worker Neha Chandravanshi (36) took a van, a bus, a train and an auto to reach the city from Gopalganj in MP. “I earn Rs 1,000 a month… it should be raised to Rs 18,000 a month… we should be made permanent,” she said. Swaroop K Ravindran, a young farmer from Palakkad, Kerala, rode his bike to Delhi, meeting farmers in Tamil Nadu, Telangana and Madhya Pradesh along the way. “I was inspired by the Long March,” he said. A four-member team of the Delhi government’s Mobile Health Scheme are there for providing painkillers, diarrhoea medicines, and pills for cold and fever to the protesters. “From 10 am to 5 pm, we have treated 699 people,” said Dr Vineet Kumar Sahu, a medical officer. Those who participated in the Kisan Long March in Maharashtra in March this year, including Narendra Varade (22), Yogi Satpute (40) and Parshoram (71) from Peint in Nashik, are also present at the Ramlila Maidan. “I work for seven hours daily on someone’s farm and earn Rs 10. After the Long March, we were promised land to survive, where is it?” asked Parshoram, who spent Rs 700 on a single train ticket — a sum he earns in close to three months. “Sarkaar se beeja maange hai yaa jagah-jameen,” said Somari Devi (70), who started her journey three days ago from a village in Runi Saidpur in Bihar’s Sitamarhi district to reach Delhi’s Ramlila Maidan. She earns Rs 50 a day working on a farm. Devi is one of the thousands of farmers and workers who have reached the capital from various states for the worker-peasant rally, to be held from Parliament Street to Jantar Mantar Wednesday. What are the farmers' demand? 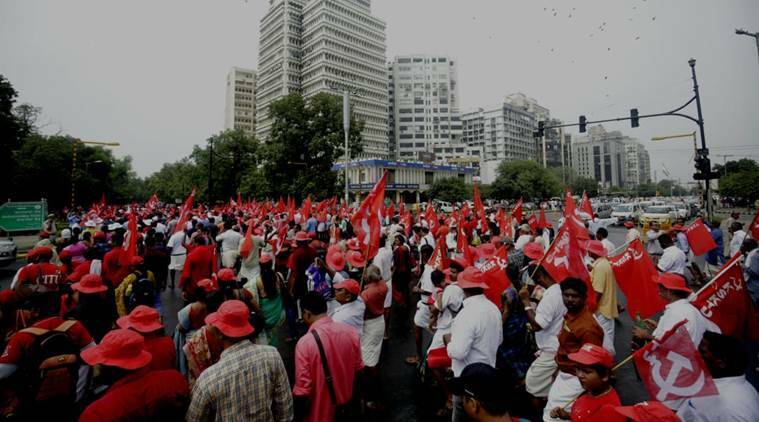 The protest has been organised by the Centre of Indian Trade Unions (CITU), All India Kisan Sabha (AIKS) and All India Agriculture Workers Union (AIAWU) — affiliated to the CPM. “The wage issue unites peasants and workers. Farmers aren’t getting minimum support price and workers minimum wage. PM Modi had promised two crore jobs, where are they? If the government can’t change policies, peasants and workers will change the government,” said AIKS member Krishnaprasad. Welcome to our Live blog. Thousands of farmers and workers have reached the national capital from various states and are camping at Ramlila Maidan for the worker-farmer rally today. Follow to get the latest updates. At the Ramlila Maidan, state-wise camps have been set up, along with a medical camp and a storage area for protest paraphernalia. On Tuesday evening, Left leaders Sitaram Yechury, Brinda Karat and Prakash Karat met the protesters. “The wage issue unites peasants and workers. Farmers aren’t getting minimum support price and workers minimum wage. PM Modi had promised two crore jobs, where are they? If the government can’t change policies, peasants and workers will change the government,” said AIKS member Krishnaprasad.